Happy New Year every one. How was your holiday season? Mine was full of back aches, flu and oh well yes there were the parties too. But mostly, the holiday season was spent resting. So much so that I could not get myself to write a blog post. But with the New Year comes new vigour. I promised myself I will try and post at least 2 -3 posts a month and I start with my very own favourite. 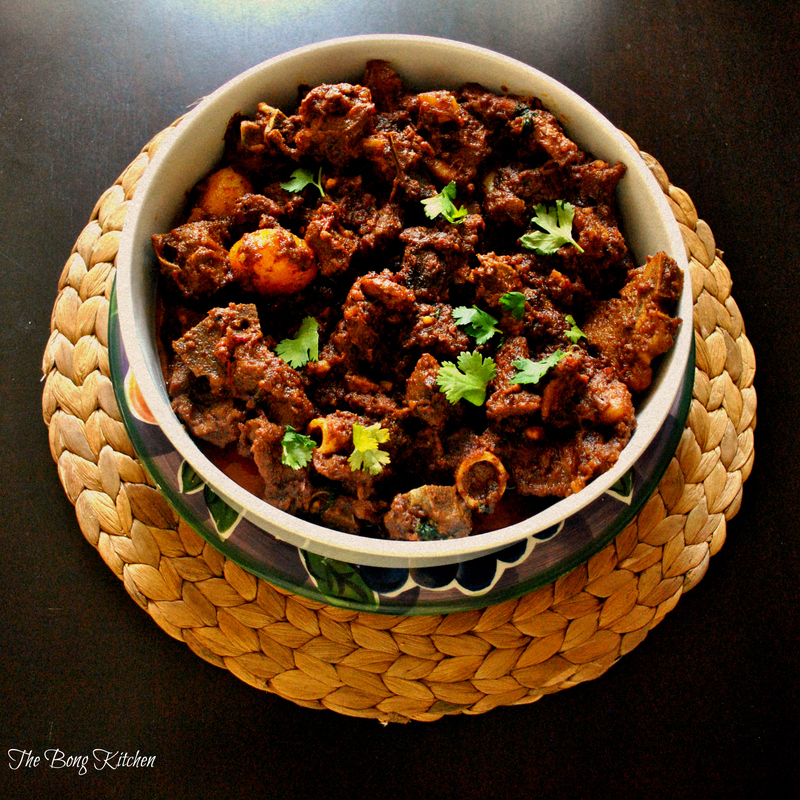 Bhuna Mutton ( or as we Bengalis call kosha Mangsho). 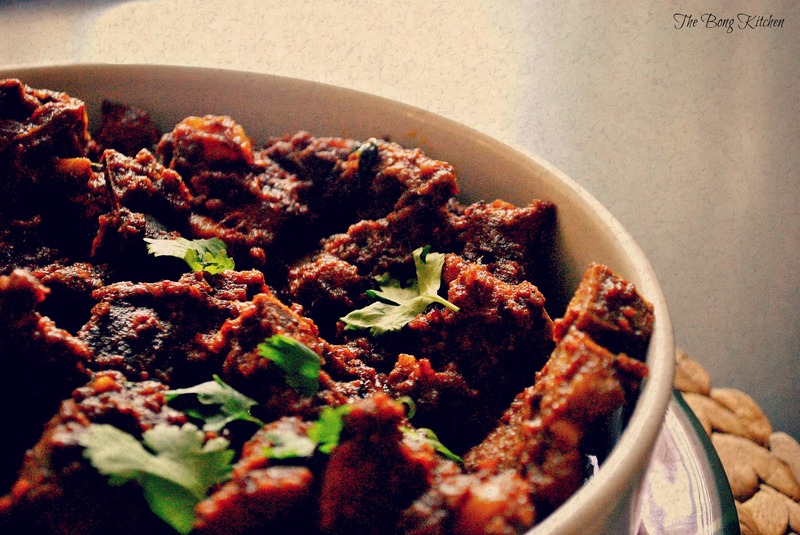 There are zillion recipes of Kosha Mangsho and every household as a unique way of making it. 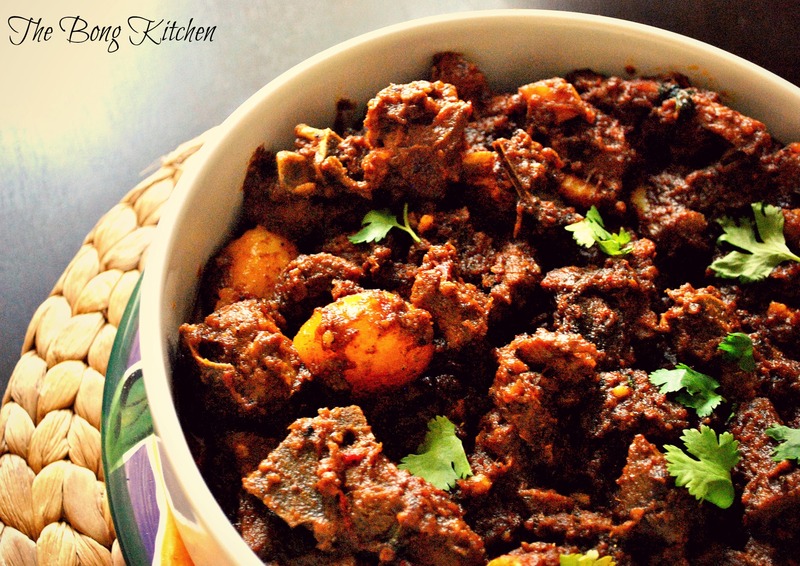 Whilst I was growing up, I do not remember my Mum making so much kosha Mangsho as she would make Mutton curry. Honestly, I donot know why but she would rarely make this dish and meant all the more craving when ever we went to Weddings ( kosha mangsho is a quintessential bengali wedding dish like rui macher kalia, and I am talking of the time when you did not have fancy caterers but just 2-3 cooks hired to cook the wedding feast). So over the years I have always had a weakness for Kosha Mangsho. When I finally took to cooking, I asked my mother and not much help there, well she would be vague, you could do this, add that but no concrete recipe. But one advise she did give me and a very useful one too, she said, try it out, use the method of trial and error and you will finally get around to your own version of kosha Mangsho. How right she was. This recipe is something I have worked on for a while and it is something I can call my very own. It does not taste like the ones you would get in the Wedding feast, I guess a part of it is my imagination, and then offc ourse there is something about as my mum says rannar haat ( everybody has a different hand when it comes to cooking). So anyhow, this particular recipe is slightly off the beaten path, a tad more labourious and requires patience but I can tell you one thing, it is worth the wait and the end product comes out beautiful. Start by marinating the meat with all the ingredients under marinade. Try and marinade for at least 12-15 hours. Next in a deep covered pan or wok. add about 2 tbs of mustard oil and get it smoking hot. Now take the meat, individual pieces and shake of as much marinade as you can and then add it to the pan. Do this in batches we want the meat to brown evenly on either sides. Seer the meat on either side of about 2-3 mins each till they are brown and then transfer to a dish. Reserve the excess marinade that is collected in the pan before adding the next batch of meat to seer. Once all the meat is seared and the liquid is reserved. Wash the pan or use a fresh one. Add the whole spices, let them smoke and then add the ghee, this way the flavours of the whole spices are trapped in the ghee. Next add a teaspoon of sugar but do not let the sugar burn. Now add the onions to it. Adding the sugar will let the onions caramalise faster. Next add the green chillies followed by ginger and garlic paste and the coriander leaves paste and continue to saute till the raw smell of the ginger and garlic is no longer there. Now add the meat pieces which was seared earlier along with the marinade and the powdered spices and salt. Cook the meat on medium to high heat evenly for 20-25 mins. This is called searing of the meat ( we are doing this the second time hence the name bhuna mutton dobara) . By about 20-25 mins most of the liquid would have dried out and the meat would change colour. It would have become darker. Now if you are like me, and prefere the meat to be on the drier side or as my friend Atul Sikand says “laga lipta” then do not add any water but if you prefer to have a little gravy add about a cup and a half of water and tightly seal the container and cook on low to medium heat for about 50 mins to an hour, I like it when the meat almost falls off the bone. Now half way through the slow cooking process what I do is I add a handful of pealed baby potatoes, Its a bong thing, you like potatoes with your meat, but that is optional. Once the meat is cooked, turn off the heat and let it rest for about 15 odd mins more, this is important, the flavours infuse really well this way. Finish off by garnishing it with coriander leaves.